Fine particles easily bypass the natural filters in the nose and throat, penetrate deep into the lungs, and carry toxins further into the bloodstream. Studies show that reduced resistance to disease is linked, among other things, to wood smoke exposure. Smoke produced by wood combustion harms the cellular membrane, slows down immune system activity, damages the inflammatory cells that protect and clean the respiratory tract, and also disrupts enzyme levels. (Lung Assn. Quebec). Original picture size 3 7/8 " by 3 3/8" at 900x enlargement. Chest p.1232. Interstitial Lung Disease and Domestic Wood Burning, Ramage, Roggli, Bell and Piantadosi. The wood smoke particle swells up inside the body. It swells up inside the 99% humidity of the lung. Growth is between 70% and 92%. Higher loads of the combustion toxics are deposited directly into the lung. More than 90% of the woodsmoke particle mass consists of fine particles, the fraction of pm that many researchers consider to have the greatest association with adverse health outcomes. in addition to fine pm, woodsmoke emissions contain components such as carbon monoxide (an asphyxiant), various irritant gases such as nitrogen dioxide, sulfur dioxide, hydrochloric acid, and aldehydes such as formaldehyde and acrolein, and chemicals known or suspected to be carcinogens, such as polycyclic aromatic hydrocarbons (pahs), oxygenated pahs, and polychlorinated dioxins and furans. Findings from animal toxicological studies demonstrate a reduction in pulmonary anti-bacterial defense mechanisms associated with woodsmoke exposure. woodsmoke exposure can disrupt cellular membranes, depress macrophage activity, destroy ciliated and secretory epithelial cells and cause aberrations in biochemical enzyme levels. A large body of evidence links PM with adverse health outcomes, including excess cardiopulmonary illness. Epidemiological studies show a coherence of data among studies of health consequences for those exposed to woodsmoke. persons at higher risk include young children, the elderly, and people with preexisting cardiopulmonary disease. demonstrated effects include increased pulmonary symptoms, increased hospital admissions for lower respiratory infections, exacerbation of asthma, and decreased pulmonary function in school-age children. There are many different types of aldehydes, many of which are poisonous or can irritate our eyes, nose and lungs, or are just plain smelly. Two such aldehydes are acrolein and formaldehyde. They may be in the air as gases, or mixed with particulate material. Acrolein irritates our eyes, nose and our lungs, and is a special problem for some people who have asthma or bronchitis. It is often a product of burning wood but acrolein can also be made when fat burns, as happens on a charcoal barbecue when fat from the chops and sausages drips on to the hot beads. Formaldehyde also irritates our eyes, nose and lungs and may cause cancer in some people. It comes from burning materials containing carbon but is also commonly used to make some types of special glues for making boats and in making particle boards for floors and walls. Therefore, it may be found in the air near factories that make such products. It is also used for making several types of plastics, such as "Bakelite" and laminates that are used on kitchen tables and benches. Formaldehyde can also come from gas stoves, or kerosene/oil/gas space heaters which do not have flues going outside the house. In many cases, formaldehyde concentrations may be much higher inside a house than outside. Some people can become very sensitive to formaldehyde so that very tiny amounts can make them sick. Size distributions of particles generated from forest fire (vegetation burning). Gerontological Society of America's (GSA) 65th Annual Scientific Meeting. Center at the University of Southern California. emerging evidence that exposure to particulate air pollution may have adverse effects on brain health and unctioning as well." deposit deep in the lung and possibly the brain -- may be an important environmental risk factor for reduced cognitive function. of tests assessing word recall, knowledge, language, and orientation. remained after accounting for several factors, including age, race/ethnicity, education, smoking behavior, and respiratory and cardiovascular conditions. "An increasing range of adverse health effects has been linked to air pollution, especially particulate matter. Short-term exposure exacerbates existing respiratory and cardiovascular symptoms and increases the risk of symptoms, hospitalisation, and death. Long-term exposure increases the risk of chronic respiratory and cardiovascular disease and death, impacts on birth weight, and can permanently affect the lung development of children". http://www.environment.nsw.gov.au/resources/air/actionforair/09712ExecutiveSummary.pdf - Page 22. "Common effects of air pollution include changes in heart and lung functions with increases in associated medical conditions such as asthma, bronchitis, and heart disease. Air pollution also contains compounds which can affect the nervous system and are carcinogenic. Some research has found that the adverse health effects of air pollution has a real cost to the community through increased hospital admissions and premature deaths". Think of others before you strike! World Health Organisation (WHO) - latest findings. Link between air pollution and cardiovascular disease. Inflamation in blood vessels and the brain. Fine particle matter linked to acute coronary events, especially in elderly. Is air pollution a risk factor for rheumatoid arthritis? Our lungs are at risk too! Exposure to air pollution accelerates build-up of calcium causing heart disease. Does air pollution outway cycling health effects. Add to this wood smoke pollution in Tasmania and the answer is yes! Harmful pollution goes up in the flames. What goes up must come down! Bushfire smoke, silent, deadly danger to our health. Wood smoke references and links - Research articles. Particulates from wild fires (and prescribed burns) raise cardiopulmonary health concerns. The smoke in the Tamar valley, today is terrible. Yesterday it was bad enough, I had runny eyes etc, today I am having to constantly use my ventolin just to be able to take a breathe without coughing. Do you have any suggestions as to who I can complain to? I looked up the complaints form for the FPA and they want details as to where the smoke is coming from and I don't know. There is a large pool of smoke coming up from the South West and there has been a lot of smoke coming up from the North/ North East over the last two days (blotting out Mt Arthur, particularly late in the afternoon, from my place in XXXX). The hills are just white. 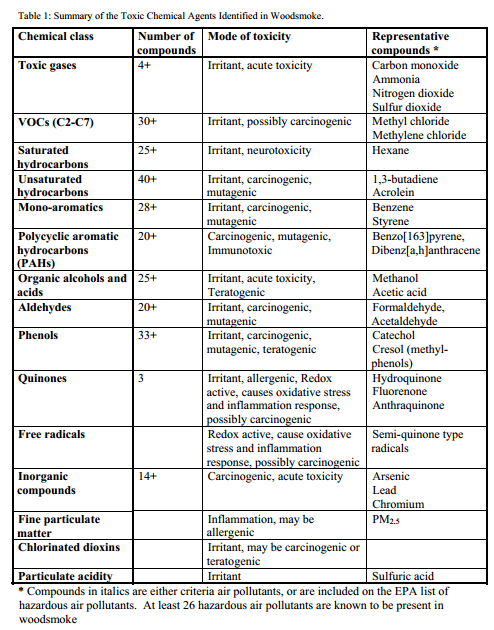 Carcinogenic substances - some of the carcinogenic substances identified in wood smoke include aldehydes and polycyclic aromatic hydrocarbons and dioxins. If wood is burned properly, the only products that will be formed are a gas called carbon dioxide, some water which comes off as steam and a small amount of ash, which cannot burn. However, often the wood does not burn completely and it can make a lot of smoke with hundreds of different chemicals, called "products of incomplete combustion". We can put these many different chemicals into groups of similarity called classes. Scientists know that some of these chemicals can cause problems for people, like causing disease in their lungs or heart, or making their illness worse if they are already sick. However, there are a number of chemicals Scientists still hardly know anything about their affect on human health and research is being done to try and find out. Some of the chemicals are gases, some are liquids and others are solids. When there is more of a chemical mixed into the air than is good for us, we call it a pollutant. Carbon dioxide is a gas that we cannot see or smell. It is given off whenever anything that contains carbon in its chemical structure is burned completely, along with water. It is not dangerous to us in open air but it can asphyxiate us if there is too much of it in a small space. In other words, it prevents us from getting enough oxygen from the air to keep us alive. It is also what we call a greenhouse gas, which may be causing the earth to warm up. Carbon dioxide stays in the air for a century, some of it into the thousands of years. And the world carbon dioxide pollution levels are accelerating yearly. Every second, the world's smokestacks and cars pump 2.4 million pounds of the heat-trapping gas into the air. -James Buttler, Director of global monitoring at the National Oceanic and Atmospheric Administration, Boulder,Colo. Nitrogen oxides can be made by fire, either because the fuels used contain chemicals with nitrogen in them, or because the fire is so hot that a small amount of nitrogen from the air combines with oxygen to form them. For example, a gas flame will often make nitrogen oxides because it is very hot. Nitrogen oxides are also made by burning fuels like petrol and diesel in the engines of cars and trucks. There are two main types made by burning: nitric oxide (NO) and nitrogen dioxide (NO2), although there are some others that may be made in smaller amounts. Nitrogen dioxide may also come from some industrial factories that make a powerful acid called nitric acid, factories that galvanise steel (coat it with zinc) and others that make glass or power stations that generate electricity. Nitrogen dioxide has more effects on our health than nitric oxide. It can irritate our lungs and cause bronchitis and other lung diseases. Over a long time, it can cause scarring of the very delicate air spaces in our lungs and reduce the amount of oxygen that they can absorb into the blood. Because of its health effects, there is an air quality standard of 0.16 ppm for an hour. Webmaster's comment: The lifetime of PM 10 is from minutes to hours and its travel distance varies from less than a kilometer to 100 kilometers (NRDC, 1996). When we speak of air pollution, particles are simply small materials that can be suspended or will float in the air. Particles can be quite large (PM10's) like sand blown from the desert on this site's home page, or may be too small for us to see without a microscope. A large collection of particles is called particulate material or sometimes just particulates. Dusts and fumes from chemical processes, welding, painting, gritblast cleaning and other industrial processes. Fog, mist and "smog", which are really tiny droplets of liquid and sometimes solid particles, formed by natural processes in the atmosphere - sometimes called aerosols. This is a very large group of chemicals that contains many hundreds of chemicals of many different classes. However, they are all chemicals that contain carbon. The word Volatile in their name simply means that they evaporate easily, like water does when it dries in the sun. Some may contain carbon and hydrogen only. Others may have carbon, hydrogen and oxygen, while some may also have other elements like sulphur or nitrogen in their molecules. Because there are so many different types, the effects of every one of them on our health may be different and are not always understood. Also, many of these chemicals help form a type of pollution called photochemical smog, in which ozone is formed, and is found in some large cities, such as Sydney and Melbourne. We do not believe that this type of smog pollution is a problem in Tasmania. Polynuclear aromatic hydrocarbons are a group of chemicals that are usually formed when materials containing carbon are burned very badly. We find them in black smoke, soot and tar from burning coal, wood, heavy oil, and other things like plastic, if there has not been enough air to burn them properly. They can also be formed when we burn our toast at breakfast. They are quite complicated chemicals that do not evaporate easily, so they are often found sticking to particles of carbon. If the particles are small enough, they will get right down into the deepest parts of the lungs and may cause disease, including cancer. We have known for a long time that one of them, called benzo(a)pyrene, can cause cancer. In the old days, chimneysweeps sometimes developed cancer due to benzo(a)pyrene in the soot that covered them every day as they worked. Benzo(a)pyrene is also included in the new Air Toxics NEPM. Benzene is probably the worst of them, because it is very poisonous, affecting people's livers and nervous systems. It probably also causes cancer. For these reasons, it has been removed from petrol, so it is much less of a problem than it was a few years ago. However, it is still made in car engines and comes out in the exhaust gases. Toluene is not so poisonous as benzene, but is still a pollutant that comes from car exhausts. It is also found in smoke from fires and some other processes. Xylenes (there are three of them) are often found in special paint thinners and brush-cleaning solvents or paint strippers. They are also made in car engines and wood fires. They are very irritating to our eyes, nose and lungs. Australian Child Health and Air Pollution Study. (ACHAPS) Final Report - May 2012. Concentration is the word we use to describe how much of a pollutant is mixed with the air. There are two main ways, called "units", that we use to describe concentration. For particles, we use "micrograms per cubic metre", written as "1 µg/ m3". If you read further down, you will see a description of particles, or particulate matter. If you imagine a large cardboard box that is one metre high, one metre wide and one metre deep, it will contain one cubic metre of air. It is written as "m3". This is called the "volume" of air. One microgram is one millionth of a gram. This is very tiny amount, but still large enough for us to measure. We shorten this to "1 µg", where the Greek letter "µ" means "millionths of", and "g" means "gram". So a concentration of one microgram of smoke per cubic metre means that there is one millionth of a gram of smoke in each cubic metre of air, and we write it as "1 µg/ m3". For gases, we use another unit, called "parts-per-million", written as "ppm". This is a little harder to explain. There are several gases described lower down on this page. For example, carbon monoxide is a gas that often occurs in air. Imagine the same large cardboard box that you did before, containing a volume of one cubic metre of air. If we take a tiny box that has a volume of one cubic centimetre of carbon monoxide and add it to the air in our box, we make a concentration of 1 part-per-million of carbon monoxide in air, which is shortened to "1 ppm". "Particulate pollution is the most important contaminant in our air. ...we know that when particle levels go up, people die." (Joel Schwartz, Ph.D., Harvard School of Public Health, E Magazine, Sept./Oct. 2002). "For particles and ozone, it is possible to derive a quantitative relationship between the concentration of the pollutant as monitored in ambient air and specific health outcomes (usually mortality)." (Australian NEPM Review Discussion Paper 2010). “There is no safe level of exposure to particle pollution. Over many years, exposure has similar long-term consequences to environmental tobacco smoke, including the risk of lung cancer and heart disease.” (Dr James Markos, Respiratory Physician and Chairman of the Tasmanian Branch of The Australian Lung Foundation). The U.S. Environmental Protection Agency has determined that any length of casual exposure to particle pollution poses serious health risks, such as early death, cancer and cardiovascular and respiratory harm (American Lung Association). HEALTH ALERT - Asthma and COPD sufferers are at an even greater risk from their prescribed drugs. Particle pollution also has an adverse effect on all other life forms including plants. Lung cancer and wood smoke exposure connection (Delgado J, Martinez LM, Sánchez TT, Ramirez A, Iturria C, González-Avila G). A study by the University of Washington in Seattle showed that 50 to 70 percent of the outdoor levels of wood smoke were entering homes that were not burning wood. Particulate matter is one of the most significant emissions from forest fires. Ninety percent of particulate matter in biomass smoke is PM10, meaning that it is 10 micrometers or smaller in diameter (EPA 1998; Ottmar 2001). Wood Smoke is greater than 90% Fine Particulate Matter, ie, PM 2.5 or less. (American Lung Association). "The majority of particles emitted from biomass burning, which includes controlled burning and uncontrolled fires, are ultrafine, with only a small fraction in the larger size range, and with most of the mass present in particles less than 2.5 um in aerodynamic diameter (WHO, 1999)." Air quality. Carbon particles in the air from the burning of fossil fuels, wood, and other materials scatter and absorb UVB rays, diminishing vitamin D production. The inhalation of particulate matter CAUSES asthma, upper and lower respiratory tract infections, COPD (chronic obstructive pulmonary disease), and Ischemic Cardiomyopathy (Dost 1991; Eeden 2001; Health Research Working Group 2001; Larson and Koenig 1994). "Air pollution in general is increasingly recognized as a systemic health threat, impairing the functioning of virtually every organ system." - Read what the Utah Physicians for a Healthy Environment (UPHE) have to say. "...certain sensitive groups can experience more severe short-term and chronic effects. It appears that the same population groups that are susceptible to particles in cities are also susceptible to particles from biomass burning. These groups are: people with asthma and other respiratory disease, people with cardiovascular disease, children and the elderly. Pregnant women and unborn children are potentially susceptible, given that smoke from biomass burning contains many of the same compounds found in cigarette smoke. This commercial explains in 30 sec. why heating your home with wood is one of the worst things you can do for your own health. From Utah Physicians for a Healthy Environment Click on the image above. Come on over for a smoke! Hilary Burden writes for the Mercury. Mercury photo. Click on the picture above to read her story. If people want to deliberately self-harm then that is their business, but letting their smoke extend beyond their boundary is everyone's business. With all our point sources of smoke, Tasmania is a designated smoking area! But where are the victims? No post-mortem states air pollution to be a primary cause of death, and few people take a day off work because of it. Yet we now know that PM2.5s, which get deep into the lungs and bloodstream from exhaust fumes, can greatly worsen respiratory and heart conditions, trigger heart attacks and lead to brain damage, cancers, even nerve, liver and kidney diseases. “For everyone who dies, there are many more hospitalised or who have impaired health.” “Prolonged exposure to elevated [particulate pollution levels] is associated with significant life-shortening and poor respiratory health. Acute episodes can precipitate death.” - Ian Mudway, King's College, London. Our prettiest air pollution - but how bad is it? Air Pollution or Smoking, Which is worse? A letter from Dr Pope. More bottled air being sold here and here. Pure Air Tasmania -Two medical doctors sell 1 litre of bottled air for A$59.00! Surely though, this tells us the burning authorities in the polluted countries are the ones at fault! And how stupid is this when we know what we do? People being paid to inhale smoke. I trust they are going to do a long term health study on the participants! And trust they declare any pecuniary interests. New research establishes how air pollution causes damage and inflammation to blood vessels not just in already susceptible people but also in young, healthy adults. Scientists from the Brigham Young University in the United States studied the effect of PM 2.5 on 72 healthy, non-smoking, adults whose average age was 23. PM 2.5 is particulate matter 2.5 microns in size - a common, critical and dangerous pollutant that is found in emissions form motor vehicles, factories, power plants fires and even tobacco smoke. They showed that periodic exposure to PM2.5 was associated with abnormal changes that trigger cardiovascular disease. People exposed to higher levels of pollution had micro-particles in their blood indicating high levels of cell injury and cell death. They also had elevated levels of proteins that inhibit blood vessel growth as well as higher levels of proteins that indicated inflammation of blood vessels. The study, the researchers said, substantially expands the understanding of how pollution causes cardiovascular disease and that particulate matter actually triggers a cascade of negative health effects. This cascade could manifest as high blood pressure, heart disease and stroke among younger people than those in which these diseases occurred previously. The findings were published in the journal Circulation Research. COPD vs. Emphysema: What's the Difference? Symptoms tend to worsen over time, especially if exposure to smoke is not eliminated. "To evaluate lung toxicity....in terms of the mass of fuel consumed smoldering eucalyptus demonstrated the greatest lung toxicity of all the fuels tested. ...smoke from flaming eucalyptus and peat was the most toxic to the lungs." Smouldering eucalypt smoke is the most toxic of all smoke tested. Cleanairtas does not agree with the US coloured Standard table. We know that there is no safe level of particulate pollution! "Short-term exposure exacerbates existing respiratory and cardiovascular symptoms and increases the risk of symptoms, hospitalisation, and death. Long-term exposure increases the risk of chronic respiratory and cardiovascular disease and death, impacts on birth weight, and can permanently affect the lung development of children" - Environment NSW page 22.